The wallowing, trampling, and foraging of Pleistocene megafauna probably maintained the open character of mountain bogs in the southern Appalachians during the Ice Ages. 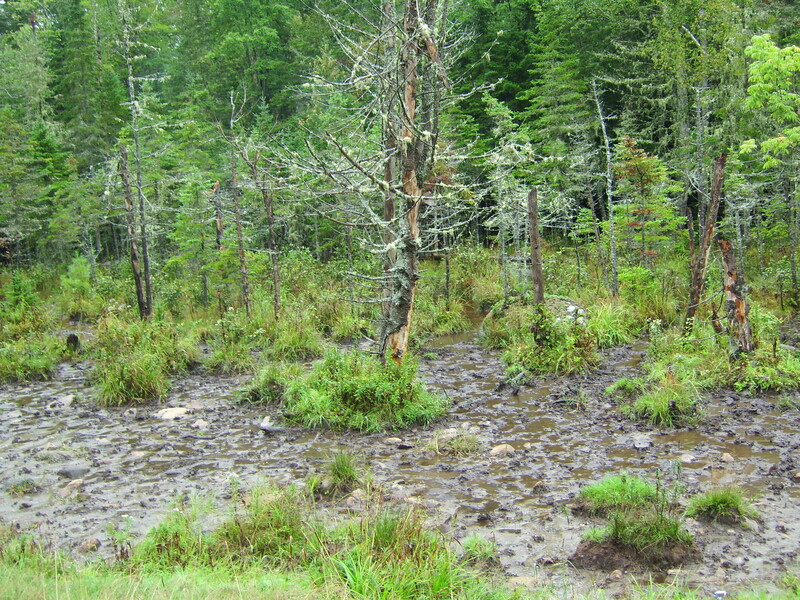 Bogs were common natural environments during moist interstadials when cool temperatures reduced evapotranspiration rates and total precipitation increased. Bogs occurred near the headwaters of mountains rivers and upper piedmont streams on flat poorly drained sites. Boggy communities were “embedded” in mixed forests of pine, spruce, oak, and beech; and they provided a diverse array of habitats for wildlife. Beavers created some bogs by damming streams. The backwaters flooded depressions created by the wallowing activities of mastodons, horses, bison, peccaries, and possibly the extinct stag-moose (Cervalces scotti). Scientists don’t know whether Cervalces scotti wallowed or not–some species of deer such as the present day moose wallow while other species do not. Abandoned beaver ponds succeed to wet meadow communities consisting of herbs, grass, and sedge; thus attracting additional herds of megafauna that continued to maintain the open nature of the bog. These vast wet meadows were ideal habitat for the extinct giant beaver (Casteroides sp. ); a species that preferred to eat softer vegetation than its present day cousin. Eventually megafauna herds migrated away and shrubby vegetation took over, creating yet another type of habitat. Then, the shrubs gave way to trees such as red maple, sweetgum, tulip, black gum, pitch pine, and oak. Beavers returned, removed trees, made dams, and the cycle began anew. Sweetgale Fen in Maine. This is a shrub-dominated fen. Shrub and grass-dominated bogs may have been common in the upper south during moist but cool interstadials of the Pleistocene. Bogs are replenished by precipitation. During really dry cold phases of Ice Ages many of them dried up, but this type of environment never disappeared completely. 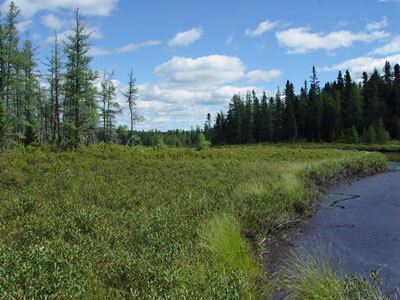 Cool temperatures slowed evaporation, allowing bogs to remain in mesic localities. Bogs are acidic environments where sphagnum moss grows. They differ from wetlands known as fens that are fed by groundwater. Fens host neutral or alkali soils. There are no true fens in Georgia because groundwater seeps through acidic bedrock. The nutrient poor acidic soils of bogs support many interesting plants such as purple pitcher plant, alder, azalea, mountain laurel, cranberry, and blueberry. 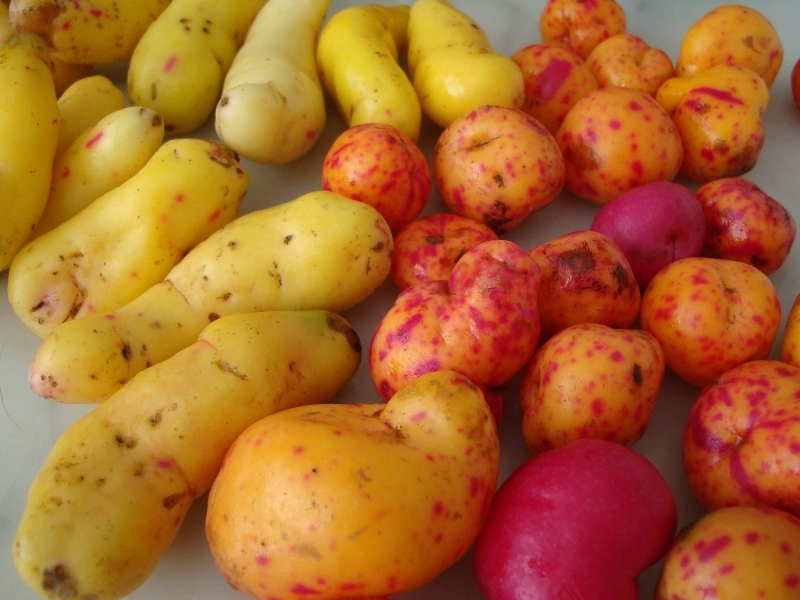 They are all well adapted to poor acidic soils. Pitcher plants obtain nitrogen from insects they trap in their leaves. Alders can fix nitrogen from the atmosphere. Members of the heath family (mountain laurel, azalea, blueberry, cranberry) have a symbiotic relationship with underground fungi that helps them extract nitrogen from soils with low levels of this element. Mountain bogs are rare in Georgia today because they occurred on flatlands that were soon cultivated by European settlers. A few still exist in Rabun and Union Counties. They provide habitat for some bird species presently considered rare in the state including ruffed grouse, woodcock, and willow flycatcher. This indicates these 3 species were abundant in the southern Appalachians during Ice Ages when bogs were more widespread. Large mammals wallow in mud to rid themselves of parasites. After the mud dries they scrape off the dirt by rubbing against trees or large boulders. They wallow in the same places, creating depressions that alter drainage patterns and plant species composition. Youtube video of an elephant wallowing. I assumed all traces of megafauna wallows have disappeared over time, but E. Breck Parkman, a California archaeologist, believes he’s found an old megafauna wallow. The site is known as the Mammoth Rocks and is located in northern California near the coast. He’s found a depression next to the rocks. He thinks this depression was used as a wallow, and the mammoths rubbed the mud off on the adjacent rocks. He also thinks California’s vernal pools, an environment of mysterious origin, were former megafauna wallows. Other potential “rubbing rocks” have been found in New Mexico, Texas, Minnesota, and Wisconsin. It may be possible that Pleistocene-aged megafauna wallows may be present in Georgia. Unusual depressions next to exposed rocky outcrops may be wallows. However, paleo-wallows in Georgia are probably difficult to find and decipher. Most have been filled with organic sediment, and many have been obliterated by agricultural practices. Moreover, trees were more abundant than rocky outcrops. Trees rubbed by extinct megafauna have long ago decayed to soil. An archaeologist believes mammoths wallowed in this depression and used the rocks to rub off the caked dirt. 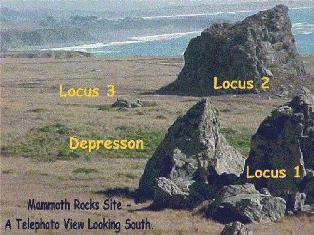 This site is known as the “Mammoth Rocks” and is located in northern California. During the Pleistocene this region was a coastal prairie farther above sea level than it is today. Paleo-wallows like this may exist in southeastern North America but are probably harder to find because megafauna used trees instead of rocks to rub off dried mud. During my wild oat days my friends and I would cruise old country roads and throw our empty beer bottles at road signs. We did not know the superior hand-eye coordination that often led to smashed glass saved the lives of many a shrew. Researchers examined nearly 3000 empty glass and plastic bottles and aluminum cans along a road in the Cherokee National Forest, North Carolina and found a total of 202 dead shrews and other small mammals. One single container contained 8 trapped shrews alone. Shrews like to crawl inside small holes for cover and to hunt for insects and mice, but the slick surface of glass or aluminum prevents them from gaining a footing, if the container is tilted at an angle of greater or equal to 15 degrees. They will slide backwards when attempting to exit such a trap. Eventually, they die of starvation or stress or they drown in rain water or the liquid remnants of the container. 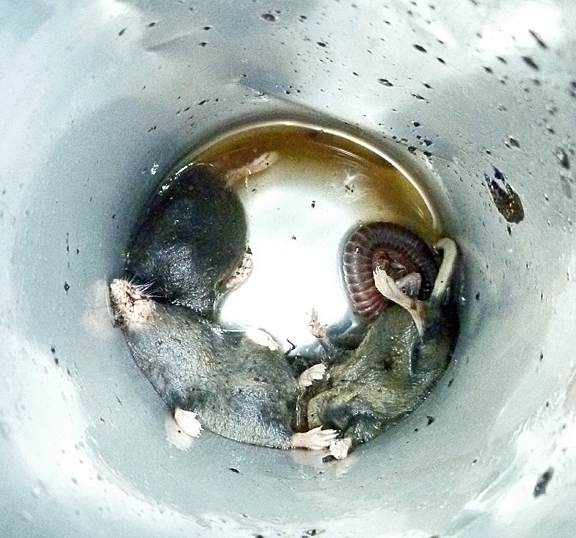 3 shrews, a millipede, and a beetle were trapped and drowned in this discarded beer can. The researchers found 8 species of small mammals trapped inside containers including 134 northern short-tailed shrews, 29 smoky shrews, and 5 southeastern shrews. They also found the remains of other kinds of small mammals–19 white-footed mice, 4 deer mice, 7 woodland voles, 2 southern bog lemmings, and 1 house mouse. Glass containers were deadlier because glass is slicker than aluminum. A discarded container without the lid is a hell on earth for small mammals. If you can’t hit a road sign, make sure you put that container in the trash. I was a little too old for Sesame Street when PBS finally began broadcasting in northeastern Ohio circa 1972. Nevertheless, I watched the show because it was something different. Then, we didn’t have hundreds of satellite and cable networks, let alone a youtube that allows a person with internet to access millions of any kind of videos they can think of. Instead, we were limited to the Cleveland and Youngstown affiliates of ABC, CBS, and NBC along with independent uhf channels from Pittsburgh and Cleveland. The independent Pittsburgh station offered Rocket Robin Hood cartoons and poster board representations of Marvel superheroes that had audio dialogue. The independent Cleveland station showed Shock Theater–double features of B movie horror flicks. One had to endure a fuzzy reception to enjoy either station. So Sesame Street was a kind of novelty compared to the limited options available then. Big Bird, the iconic character who lives in the fictional world of Sesame Street, is much more famous than some real life big birds that lived from before the Pleistocene until well into the Holocene. The fictional big bird of the PBS series Sesame Street is supposed to be 8’2″ tall. Elephant birds were the largest species of bird to ever walk on earth. They lived in Madagascar until ~1800 AD. Humans likely overhunted them to extinction. The largest species of elephant bird, Aepyornis maximus, grew as tall as 10 feet and could reach weights of 1100 lbs, and their eggs weighed 22 lbs. There were 2 genera of elephant birds–Aepyornis and Mulleronis. Scientists dispute the number of species in the Aepyornis genus. Some think there are 4 species; others suggest all the fossil material belonged to just 1 species. Illustration of the extinct elephant bird (Aepyornis maximus). Moas were another species of big bird that rivaled the fictional Big Bird of Sesame Street in size. There were 11 species of moas native to New Zealand, the largest being Dinornis robustus. It grew to 6’6″ tall and weighed over 500 lbs. Humans reached New Zealand about 1400 AD, and they overhunted moas into extinction within 200 years. Archaeologists have discovered big piles of moa bones in human settlements, and the extinction of these birds is considered an excellent case study of humans overhunting species of vertebrates to extinction. 11 species of extinct moas roamed New Zealand until humans overhunted them into extinction. They did not use bows and arrows as the illustration depicts. Elephant birds and moas belong to a family of birds known as the ratites which also includes ostriches, emus, cassowaries, rheas, kiwis, and tinamous. All of these species, with the exception of tinamous, are flightless ground dwelling birds. The ratites live on continents that were once part of the supercontinent Gondwanaland. Formerly, scientists believed the ratites shared a common ancestor from when Africa, Australia, and South America were part of Gondwanaland and later evolved into different species after Gondwanaland split apart. I mentioned this belief in my post about the temporary ostrich colonization of India during the Pleistocene. (See: https://markgelbart.wordpress.com/2015/09/24/ostriches-struthios-sp-occurred-in-india-during-the-late-pleistocene/ ) However, a new study of ratite DNA determined tinamous, birds that can fly, are closely related to the extinct moas. (Tinamous were thought to be distant sister taxa to the ratites before this study.) This finding suggests each species of flightless ratite independently evolved flightlessness from birds that flew to each southern hemisphere continent after Gondwanaland split apart. This is the best explanation for the close relationship between the tinamous and the moas because it’s unlikely that flightless birds would re-evolve the ability to fly. These speciation events occurred when the continents were closer than they are today, so that the distances were easier for flying birds to traverse. After a population of tinamou-like birds established a colony on a new continent, they encountered an ecosystem that had just recently lost dinosaurs to the K-T extinction event. The ratites evolved as an ecological replacement for at least some of the dinosaurs in regions where birds faced less competition from mammals. Proposed evolutionary relationships between the ratites based on molecular DNA evidence. There are 47 species of tinamous. They are native to South America, Central America, and southern Mexico. They nest on the ground but will roost in trees and are omnivorous, feeding upon fruit, plant matter, insects, worms, and herpetofauna. There are some anatomical similarities that suggest tinamous are related to other ratites, but if not for DNA evidence, scientists would never know that they are ratites themselves. Brushland tinamou (Nothoprocta cinerascens). Tinamous are closely related to extinct moas of New Zealand. Because they can fly, scientists consider this evidence that all flightless ratites evolved independently from birds that were able to fly over ocean water. A brand new study suggests large packs of big carnivores kept populations of megaherbivores in check during the Pleistocene. This finding seems like a no-brainer, but some paleoecologists believe megaherbivores suffered little mortality attributable to predation and were instead limited by the availability of plant resources. The results of this study imply that large carnivore predation of megaherbivores was beneficial for the environment as a whole. Lowering the overall population of megaherbivores prevented the landscape from being denuded and protected vegetated habitats for birds and other small animals. The authors of this study compared tooth size and shoulder height between large Pleistocene carnivores and modern carnivores. They determined that Pleistocene carnivores were on average 50%-100% larger than modern day carnivores. This greater size gave them the ability to better prey on megaherbivores. Even though these carnivores were larger, they likely needed to hunt in packs to take down such megaherbivores as mammoth, mastodon, and ground sloth. Lions attacking a juvenile elephant. A brand new study suggests Pleistocene carnivores in large packs regularly killed juvenile megaherbivores, keeping their populations in check so they didn’t destroy their environments. Lions jump on the backs of baby elephants while other members of the pride chew through the tendons. Incidentally, this individual eventually escaped. The authors of this study also looked at modern incidences of predation on megaherbivores. They noted that lions killed 74 elephants in Botswana over a 6 year period. 60% of these elephants were under 9 years old–evidence juveniles were easier to kill. Lions killed 49 elephants over a 6 year period in Zimbabwe. 16% of black rhinos under the age of 2 were killed by lions or hyenas. Hyenas killed 5 juvenile elephants in Hrange National Park, Kenya in 1 year. Early European explorers reported much larger prides of African lions than are found there today. Some saw prides of 40 lions in sparsely populated areas of Africa. The authors of this study infer Pleistocene carnivores roamed the range in groups this large. This may be true for American lions (Panthera atrox) and dire wolves (Canis dirus), but I’m of the opinion that saber-tooths (Smilodon fatalis) were for the most part solitary predators, though mothers with nearly full-grown cubs likely did gang attack juvenile megaherbivores. Their specially evolved canines were an adaptation to slicing through thick-skinned necks. You are currently browsing the GeorgiaBeforePeople blog archives for November, 2015.